Picking a date range is a very common task in web apps or mobile apps, just think about a booking of any kind (flight, car rental, vacation etc. ), but often it can be a nightmare for your customers, especially on mobile devices. At Mobiscroll we try to bring the best UX solutions to work out of the box, but also leave space for customization through a rich API. Below we will discuss two possible solutions, the first one uses two instances of the Mobiscroll Calendar, the second one uses the Mobiscroll Range. A less known but powerful feature about Mobiscroll components is that they can be initialized not only on input elements, but on any other HTML element. If not attached to an input the selected values will not appear on the UI automatically, so it’s up to the developer to channel it to the right place. The jQuery objects are stored in variables to prevent running the selectors over and over again. 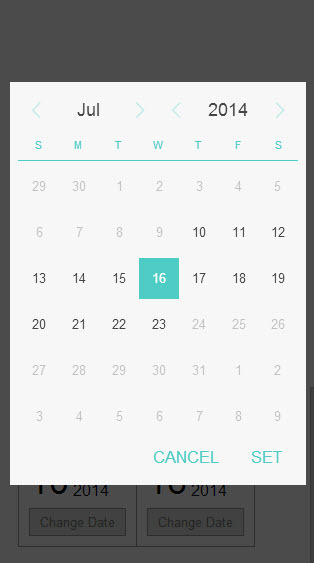 With the Range picker we can easily select a date range on a single view. We’ll still use the same markup from the previous example, but are going to initialize the range picker on the empty div, which was not used previously. Another advantage of using the Range picker is the selected days will be highlighted on the UI, so the user can visually see the selection. 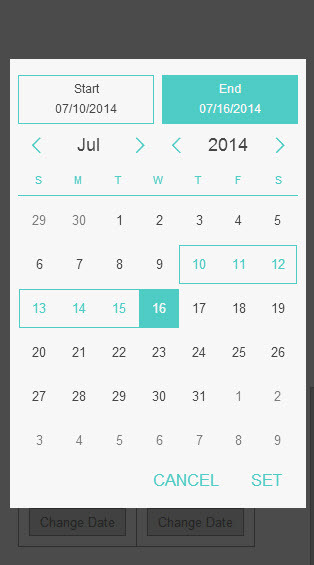 How are you handling date range selection in your mobile apps and webpages? Let us know your thoughts in the comment section below!